The Chicago Bulls have been missing some key starters for quite a few months now, their “Bench Mob” has been holding their own on the court, but it looks like they may soon be full strength again, or at least a bit closer. The real question is, when is our reigning MVP Derrick Rose going to be healthy again? Chicago obviously wants him completely recovered – no need to re-injure the nasty groin injury – but we also don’t want him coming off the bench cold turkey for the playoffs. After this morning’s shoot around he told Comcast Sportsnet Chicago, “There’s not too much to say. I’m trying to get better every day, just trying to get healthy. It’s coming along, so hopefully I’ll be out there soon,” he explained. “It’s killing me. Just being out, missing the action, some good games have been played, but really taking my injury into concern. I’m not trying to rush back, where if I do rush back too early, I could re-injure it, so just taking my time.” Rose participated in part of this morning’s shoot around practice. Found this fun little statistical chart on CSNChicago.com. You have to give head coach Thibodeau major props for ingraining a suffocating defensive strategy. The Bulls are 13-5 without their star player. We will only get better with a healthy Hamilton and Rose. 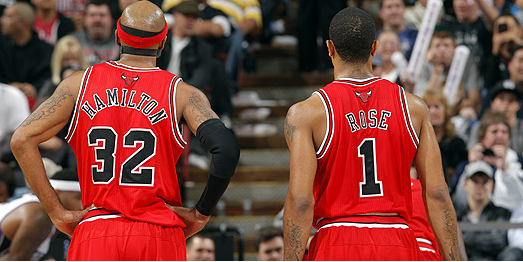 This entry was posted in NBA and tagged Bulls, Chicago, comcast sportsnet chicago, CSNChicago.com, Derrick Rose, Richard Hamilton, Rip Hamilton, Tom Thibodeau by Marques Says. Bookmark the permalink.